Summary: Imagine perceiving the future when you cannot see the present nor recognize the past. 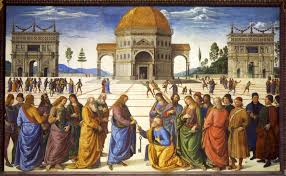 One of the most famous paintings in the Sistine Chapel in the Vatican is by Pietro Perugino, entitled “Christ Handing the Keys of the Kingdom to St. Peter.” The painting itself is notable for several important contributions to the world of art such as displaying three dimensions using linear perspective and a vanishing point. The subject matter is also an interesting metaphor for the Israeli-Palestinian conflict today. The subject of the painting reflects the establishment of the role of the pope in Catholicism. Jesus’s handing of the “keys of heaven” to his disciple Peter was considered establishing a connection between earth and the heavenly realm. The center of the painting focuses on the actual handing of the keys: one key is held by Jesus, while a second key remains dangling in the foreground. The viewer does not really notice two keys, but the single dangling key. From that key, eyes are drawn up towards the open doors of the Temple of Solomon, displayed as an interpretation of the eight-sided Dome of the Rock. This is a metaphor of the connection between the divine to the physical and up again to the divine: the keys connecting Jesus and Peter, and then the dangling key from Peter to the Temple. In the painting, the Temple of Solomon is sitting on a plaza surrounded by people and triumphal arches of Constantine. It was the emperor Constantine that welcomed Christianity to the Roman Empire in 325CE. While the Temple of Solomon sat in Jerusalem, these arches were in Rome, near the Vatican. By integrating these themes, Perugino brought Jerusalem to Rome and had Christianity flanking the holy Temple. Keys are often used as metaphors in art and poetry. Keys are not only tools for gaining access, but connote ownership. The holder of the key is considered both the rightful owner of whatever is locked, and is the sole person who has the means of gaining access to whatever the lock has sealed. In the case of this famous painting, Jesus holds the heavenly key in gold, which is paired with a darker key for Peter. The twining is a partnership bridging heaven and earth, with Peter as the rightful owner of the earthly key. 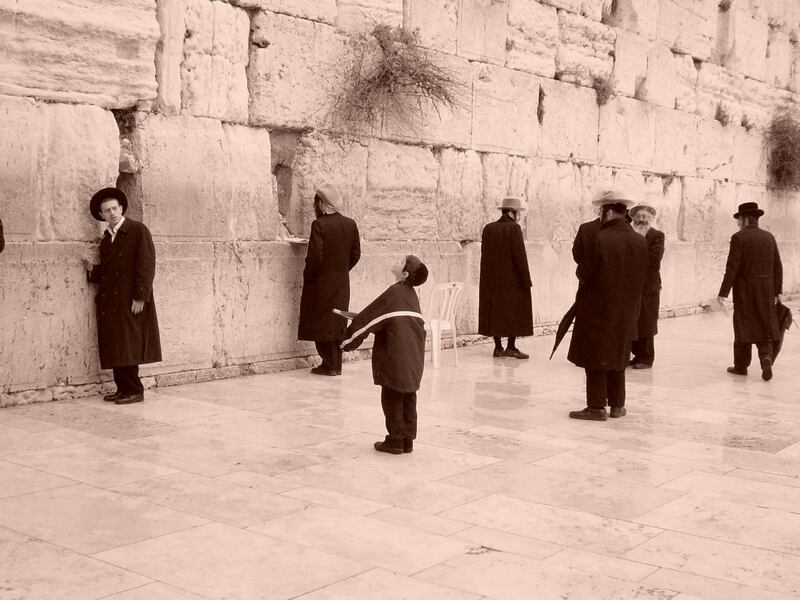 The key itself opens the Temple in Jerusalem, the physical gateway back to heaven. The brilliance of the painting lies in the suspension of the dark key. Set against a plain background in the center of the painting, a viewer has no choice but to be drawn to it. The key anchors the focus, and the story is built around it. The Middle East has a long history of using keys, both physical and metaphorical. 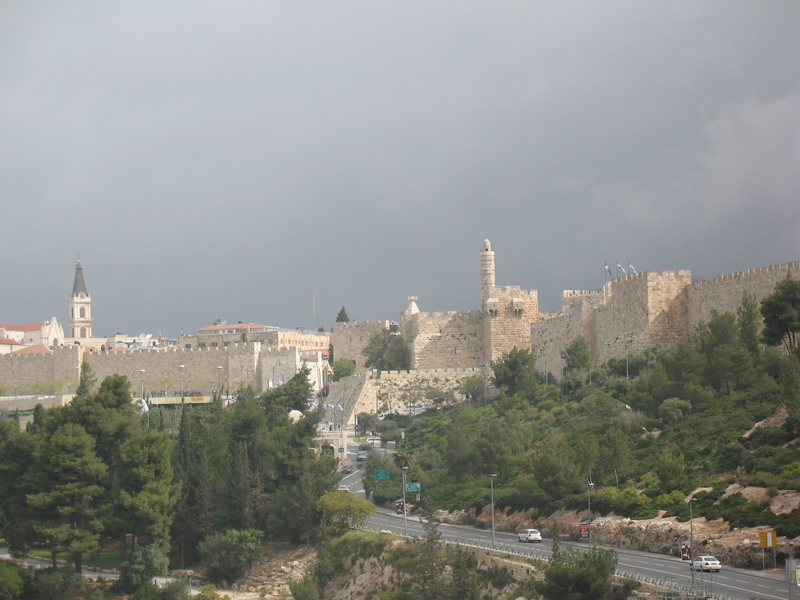 In 1917, the Mayor of Jerusalem handed over “keys of Jerusalem” to British General Allenby as a sign of surrender, and in 1841, the Ottomans handed the keys to Rachel’s Tomb in Bethlehem to Jews as a symbol of their control of the holy site. Even today, the Church of the Holy Sepulchre has a key that is held by a Muslim family as was the tradition dating back to 1246, even though the church has no religious significance to Islam. Many Palestinians carry their own physical keys with symbolic messages today: that they are the rightful owners to homes in Israel and are waiting to move there. The skeleton keys are not the actual keys to homes that grandparents abandoned in 1948 while they waited for Arab armies to destroy the nascent Jewish State. These Palestinian keys are representational of their quest to a “right of return” to homes in Israel. It has become a physical manifestation of their view of themselves as refugees. However, both the keys and status are manufactured. As detailed in “Palestinian “Refugees” or “SAPs”?” there are only about 30,000 refugees (or more accurately, Internally Displaced Persons) alive from 1948, as refugee status cannot be handed down like an inheritance. Further, a refugee is someone who left a country, not a house. International law covers refugees return to a country, not an abandoned building (and Palestine was never a country). Regardless, the acting President of the Palestinian Authority, Mahmoud Abbas, continues to put the “refugees” as a key issue in negotiations with Israelis. He does this with the blessings of the United Nations which is complicit in misleading the Palestinians. The United Nations not only created a unique agency for Palestinian refugees (UNRWA) separate from the organization that handles all other refugees in the world (UNHCR), but uniquely enables the descendants of Palestinian refugees to get services from the UN. As elaborated in “Help Refugees: Shut the UNRWA, fund the UNHCR” the staffing of the UNRWA now exceeds the total number of Palestinian refugees. The larger issue with UNRWA is not their giving extended services to millions of Palestinians who are not refugees, but the UN agency’s active encouragement of Palestinians to seek to move to, and delegitimize Israel. As in the painting “Delivery of the Keys,” UNRWA has handed Palestinians a narrative and claim to Israel: the Arabs are the rightful owners of Israel. The United Nations paints these “refugees” against a bleak background (like the key in the painting) to emphasize their stateless position. 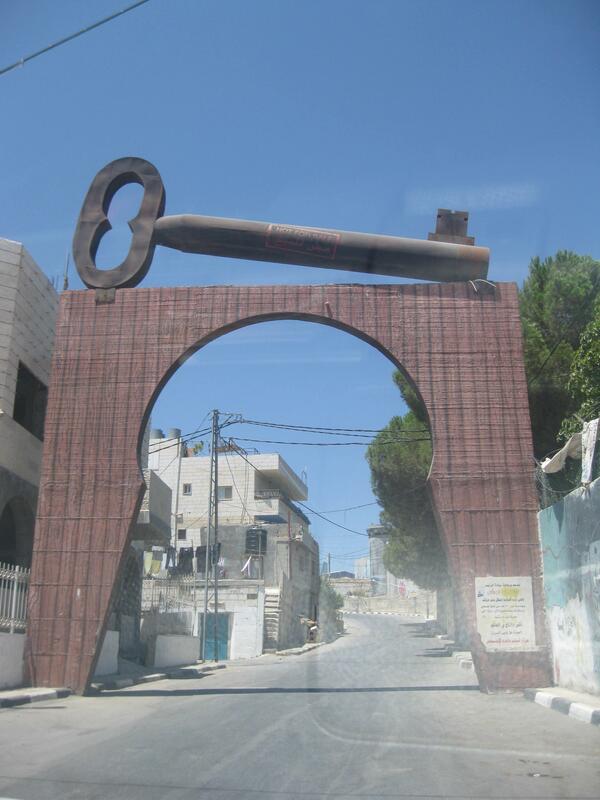 The key above the portal at the UNRWA camp is a potent symbol to all Palestinians, that it is through the United Nations that millions of Arabs will migrate to Israel. UNRWA and the Palestinians have established a pairing of keys like Jesus and Peter in the painting above: Palestinian Arabs are the owners of Israel, and the gateway to getting that land is through the United Nations. The vanishing point is where eyes are drawn to in the horizon. It is a place where parallel lines converge giving depth to a two dimensional painting. It is also the point where things become increasingly smaller and faint, disappearing altogether. In the Perugino painting, the vanishing point is the open door to the Temple of Solomon. It is this worldly portal to the heavens, where man’s prayers ascend to ethereal songs. The viewer of the painting is pulled to the very spot where the material world melts – indeed, the vanishing point. Today, a person could look at the artwork with another perspective. The Temple of Solomon, the most holy place on earth for Jews, is replaced with an Islamic shrine. The Temple, and Jewish presence has seemingly disappeared. In this Christian piece of art, the flanking of Constantian arches and Jesus and Peter in the foreground are meant to underscore that the pope and Christianity are the proper pathways to God. Judaism has faded to Islam, and both are replaced by Jesus’s emissary. Over Jerusalem Day 2015, the vanishing point added an additional dimension. The current pope, Pope Francis, canonized two nuns who were born in the holy land in the 1840s, while it was part of the Ottoman Empire. One nun was born in Jerusalem and another was born in the Galilee. Yet the pope decided to refer to these nuns as “Palestinians,” not Ottomans and not Israeli (while the status of Jerusalem is under debate, the only people that consider the Galilee part of Palestine are Hamas-supporters who seek the destruction of Israel). If one chooses to be generous and argue that the region was called Palestine in the 1840s, does the pope refer to people from regions like the Sahara (Saharans? ), the Rockies (Rockies?) or Patagonia (Patagonians? ), or does he call them Libyans, Americans and Chileans? Is the pope seeking a new replacement theology, where not only has the Vatican replaced Jerusalem as the center of divine revelation, but history itself can be updated? Is Israel being supplanted today the way the painting at the Vatican shows Judaism being replaced? The news media has certainly rallied to such vision. The New York Times decided to cover the celebrations of Jerusalem Day on May 17, 2015 from a purely Arab point of view. 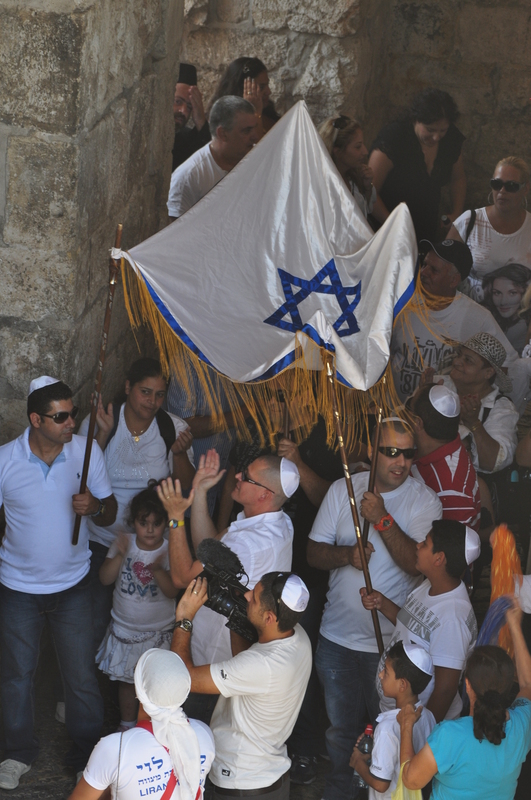 The day in which Israelis celebrate the reunification of their holiest city from which they were expelled and barred from reentry was characterized as a moment of protest. The atrocities committed by Jordanian and Palestinian Arabs during 1949-1967 vanished and this year’s celebration was mocked. The Times questioned the very essence of Israeli rights to Jerusalem as it quoted a Palestinian man ““How would you feel if somebody marched through your living room, without your permission?”” Whose house is this anyway? A Vanishing Point has interesting features: our eyes are drawn there; but the subject matter blurs and disappears. The world’s attention is focused on the Middle East and the Arab-Israeli conflict. 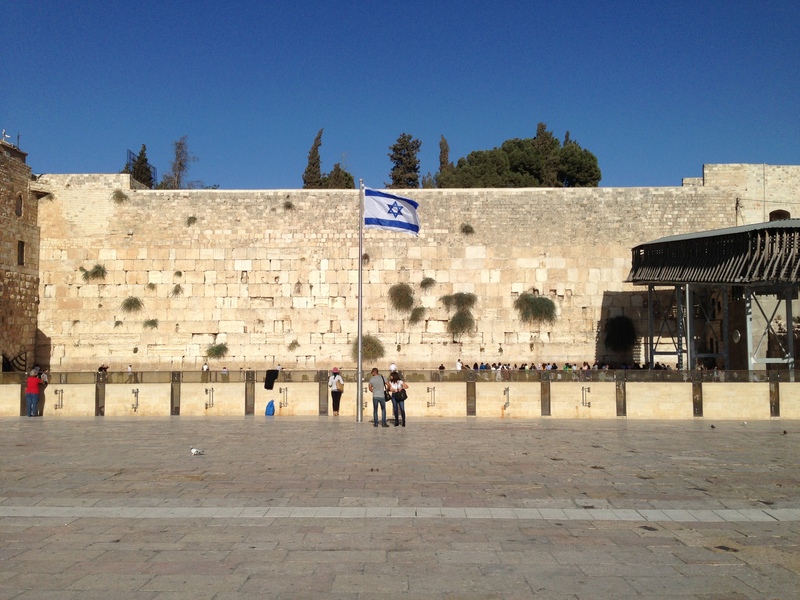 Jews and Palestinian Arabs are focused on Jerusalem and the Temple Mount. 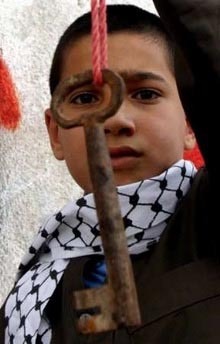 As they do, Palestinians grab hold of the dangling key and Israelis don’t see the golden key in their hand. Everyone wonders what the future will bring and ventures predictions as they gaze into the distance. And as they do so, all reality disappears.